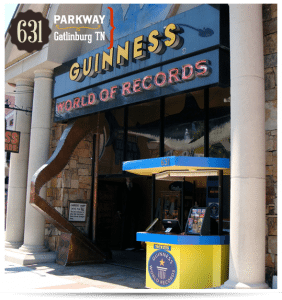 The Guinness World Records Museum in Gatlinburg contains memorabilia from famous record holders including: Elvis, the Beatles, Michael Jordan, Michael Jackson, and many more! There are hundreds of exhibits as well as interactive displays, trivia and games to create a positive, entertaining learning environment. Themed Galleries focus on various categories such as Sports, Space, Animals, Food, and Human Achievement. There are walls containing photos and other interesting facts about some of the world records. Examples of fascinating world records include a replica of the world’s tallest man, both the tallest and smallest woman, and the smallest bicycle among many others. Children can climb into a secret warehouse and see what is inside, enjoy the computerized stretchiest skin activity, and students of all ages can have fun with the multitude of exhibits to set their own records! Open 365 days a year, the Ripley's sponsored Guinness World Records Museum is a wonderful stop for all types of student groups, from educational adventures to graduation celebrations. Come with your student group and experience this amazing museum full of fun for everyone!